The InHead acoustic/electronic hybrid drumhead delivers the best of both worlds: great sounding acoustic drums and the power and control that comes with the hi-performance FSR triggering of electronic drum sound modules. This exclusive electro-acoustic InHead Kick & Snare Bundle Pack includes the tools needed to bring a new level of creative potential to the heart of the acoustic drum kit; the kick & snare! 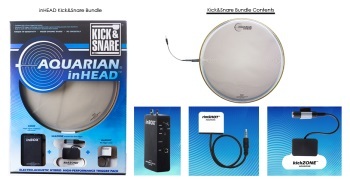 Aquarian’s Kick & Snare Electro-Acoustic Trigger bundle pack features the 14” FSR inHEAD; the world’s most advanced acoustic hybrid drum trigger. Included along with the 14” inHEAD is the inBOX; a combination signal booster, trigger conditioner and inHEAD power supply. The inBOX, when used with the inHEAD improves the performance of most popular drum trigger modules and features an input for the included rimSHOT rim trigger sensor. The rimSHOT rim trigger sensor is designed to complement the inHEAD, and together they make up a complete snare drum triggering solution with a true head to rim relationship. The combination of the inHEAD, the inBOX and the rimSHOT make for the most accurate and advanced snare drum triggering available and allows for fingertip sensitivity, a wider dynamic range and virtually no crosstalk. Also included in this professional kick & snare triggering bundle is the kicZONE: an easy to use and reliable bass drum trigger that works off the vibration of the bass drum head. An easy to understand triggering setup guide is included.